It’s rather difficult to conceive of Robert Mitchum, who famously did not care, as a version of the tee-totaling white knight Eliot Ness, but that’s more or less what he plays as Capt. Thomas McQuigg in 1951’s “The Racket”, only a couple years after he was busted for marijuana possession which just adds a little off-screen je ne sais quoi to the whole deal-io. 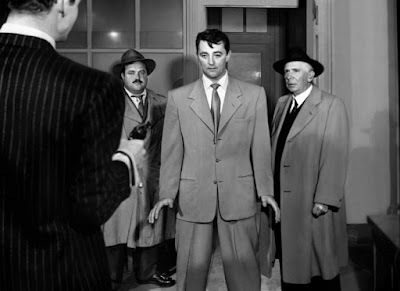 But then, the film’s producer, the notorious eccentric Howard Hughes, saw things most other people didn’t or couldn’t, and perhaps in Mitchum he saw the perfect man to portray the absurdity of law enforcement in a time and an era when so many cops wound up on the crooks’ payrolls. Indeed, the ancient role of The Last Honest Cop filtered through Mitchum’s trademark indifference makes for a compellingly different take. You know always know cops of this sort are going to win out because they just can’t give it up. With Mitchum, however, you sort of half expect him to get plugged by a fatal bullet and shrug. “Figures,” he’d say. (He doesn’t say that.) When he’s tasked with giving the requisite speech to the new gaggle of cops and explain how he expects them to stay on the straight and narrow, it’s really nothing motivational; it’s an insouciant edict. It’s wonderful. He’s Eliot Ness with a hangover. Capt. 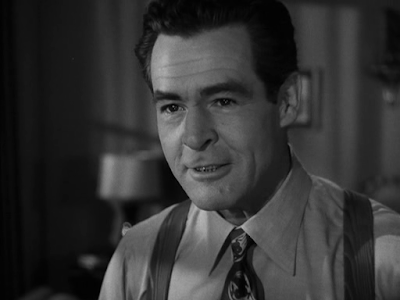 McQuigg’s primary adversary is Nick Scanlon (Robert Ryan), representative of The Old Man who runs The Syndicate, an ominous sounding organization that essentially runs the city and plans on continuing to run the city by ensuring their chosen guy wins an important upcoming election. McQuigg, of course, has other plans and Scanlon, of course, plans to ensure that McQuigg’s other plans don’t come to fruition. This leads to a tangled web of deception and murder and a multitude of characters, including a breathy nightclub singer (Lizbeth Scott). But it’s not really about any of these people; it’s about McQuigg vs. Scanlon. McQuigg, it is revealed, is peeved at Scanlon for preventing so many deserved promotions all because McQuigg refuses to be bought off. That marks this entire ordeal less as One Man Beholden To The Law and more like I’m Gonna Get Mine By Getting You. Hughes, as Hughes was wont to do, re-molded this movie, which itself was a remake of a 1929 film (which itself was based on a stage play), many times over, firing one director and bringing on another, desperate to achieve perfection. As could often happen with Hughes, that perfectionist attitude actually yields a product feeling overstuffed when its primary characters demanded something more lean and mean. The film opens, in fact, with a sequence added after the fact, one in which the state crime commission and governor meet to discuss corruption amongst the ranks. Its mere exposition and a reminder – a reminder recommended (ordered added) by the Production Code Administration – that not all lawmakers were nefarious. It feels as tacked on as it is, men in suits in distant conference rooms saying things that sound really, really important and authoritarian but don’t mean much down there on the front lines. Joseph Breen and his Production Code enforcers, in fact, had their hands all over Hughes’ production as Turner Classic Movies recounts, rejecting the first draft of the screenplay as a “new low in crime stories”, apparently because of “the depiction of the film’s ‘community’ as ‘completely lawless.’” It ordered changes and those changes got made and you can’t help but wonder just how much Hughes had originally intended to roll his characters around the gutter. Still, even as it progresses, you get glimpses of those intentions, never more so than in the performance of Robert Ryan. If Mitchum plays his part indifferent, Ryan effuses entitlement, a smug, menacing claim to anyone and anything on which he will collect, violently if need be. If in noir the anti-heroes so often expect the worse, Ryan acts as if his character is continually expecting his high-roller status to render him exempt. He can’t be caught; he can’t be killed. That makes his end so glorious even if it’s grisly, lashing out at everyone, willing to shoot anyone. You can imagine him shaking his fists at St. Peter when he gets to the pearly gates and is denied entrance. He seems to believe that he is owed absolutely anything he wants, anything but death.